"Here's What Applause Looks Like On Paper!" "Mark Wurst has worked with us for almost three years now. His performances far exceed anyone we have had in the past. Mark is professional, dependable, and creative. He also goes out of his way to make sure that our clients are happy and our events are successful. Mark is truly talented and it is such a delight to see how he engages the children with magic, laughter, just great entertainment. I highly recommend hiring Mark Wurst as a magician for any event. I assure you, you will not be disappointed!" - Jennifer Yelverton, Event Manager, Princeton Partners, Inc.
"I've known Mark for approximately two years and have had great pleasure in working with him on many of our Grand Opening and Sustaining events. 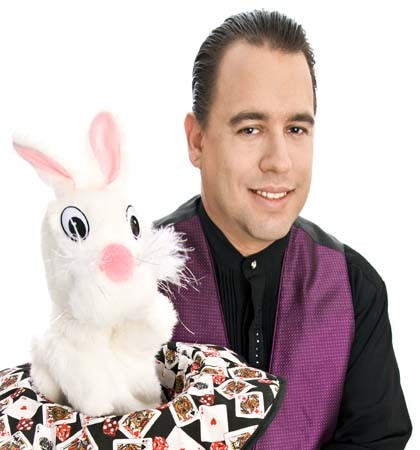 He has provided hours of great family fun including upbeat music, balloon animals and mesmerizing magic tricks. He encourages audience participation, and the wonderment and joy on some of the children's faces is truly priceless. Mark's professionalism, character and charm make him a big hit with both children and adults alike and his performances are riveting, fun and full of lots of energy. He has an uncanny ability to interact with the audience on all levels." "If you're looking for a program to entertain both children and adults as well, Mark Wurst is right up there with some of the best. The audience just loved him. The children enjoyed being included in his act and were intrigued with his magic; the adults with his humor. A great time was had by all and we look forward to having him again at the library." "Mark is a warm and accomplished performer who clearly enjoys his craft. After forging an almost immediate rapport with the audience, Mark broke out a varied arsenal of illusions and sleight of hand tricks that really entertained and kept the children's (and their parents') interest from start to finish. Calls of "Just 1 more trick!" indicated just how well the magic of Mark Wurst was received at our library! Without a doubt, Mark's show was the highlight of our Halloween party and I look forward to having him return to kick-off our Summer Reading Program. "Thank you so much for the wonderful show! It was the perfect way to celebrate the "Week of the Young Child." Sometimes it is hard to hold the attention of a four year old for very long, but your show was perfect. The "WOW" effect was there and the children were engaged for the full half hour. They loved being a part of the act and were amazed at the tricks." "I just wanted to write you a note to thank you so much for coming out to our school. All of the children really enjoyed your show!!! It was entertaining for everyone, from the 2 and 3 year olds to the kindergarteners and even the teachers. They seemed to enjoy the slapstick comedy that you put into your magic routines. It was great to see them all laughing and having a good time. We are looking forward to seeing you here again at our summer camp." "The audience was enthralled by your magic tricks, particularly the card tricks. Everyone, both children and adults, enjoyed your joke and many of the parents told me that they had had a wonderful afternoon. I liked the way you kept reiterating that children need to read in order to succeed in life. Your show was a great kick-off for the summer reading club." "We were thrilled to have Mark Wurst bring his magic program to our library. It was one of the best magic shows the Englewood Library has ever seen. Mark interacted with all of our children and their parents. His tricks were very pleasing to the children and his humor made the grown-ups laugh out loud. No one wanted the excitement to end. We would definitely have Mark Wurst back in a heartbeat." "On behalf of the Borderdentown Township Senior Citizens Group, we would like to thank you for your excellent performance at our Halloween party. The children enjoyed the show, the treat bags and balloon animals. The senior adults are still talking about the fun that they has that evening. I look forward to retaining your entertainment for other events during the year." "Mr. Wurst's program was perfect for Red Ribbon Week. His "Just Say No Magic Show" was just the right length to keep the students' attention and the message was invaluable. His communication style was well suited to the students and they loved participating in the show with him. He is very thorough, providing the school with a packet of information that can be used pre-assembly to prepare the students and also follow up activities to emphasize the message and help the students remember the important points of the show." "Thank you for coming to Gage's school and making our son's birthday a wonderful and memorable experience for him, his classmates and his family! Gage had an AWESOME time, and he really loved being the big part of the show! We loved how you kept him so involved and that smile on his face was so priceless. The magic was exciting, the jokes were silly, the school was rockin' with laughter and all the children, teachers and family had a wonderful time! I will highly recommend you to all of our family and friends. You are AWESOME!!" "The show had energy, enthusiasm, action and a lot of laughs. The show was not only entertaining but it delivered a tremendous message about the importance of recycling. Your magic show was a superb grand finale for our 2003 Summer Reading Program. With over 300 children, you drew the largest crowd this summer! The children had a fantastic time watching you perform. They especially enjoyed their active involvement in the show...and of course, the balloon animals!" "Mark, when you were with us for Summer Reading Program 2001 I thought that you were great. Now that you have visited us for Summer Reading Program 2003, I KNOW that you are. Not only did the kids love your show, but a surprising number of parents gave you rave reviews as well. You'll always be invited to Chino Hills to perform as you are one of our favorites here! Keep up the good work & listen for your phone; we'll be calling!" "The magic was great, the jokes were funny (especially the puns for the adults), and everyone had a wonderful time! I was also particularly pleased by how many children you allowed to participate. That is always such a special treat for them, and you invite more than any other performer I've seen. Even those who don't come up on stage still get to take part from the audience and that makes every child feel welcome and included. Your show was an excellent way for our Readers to wind up a great summer!" "The kids loved it and many of the parents and other adults have stopped by to say thanks. Besides the great show, the kids also loved the balloon animals. We look forward to having you again next year for another fabulous show. The way that you interact with the audience and get them involved is great." "You and your wife helped to make our grand opening summer one to remember. I especially liked and appreciated that you brought hand-outs for all of the children. That added an extra special touch to a wonderful performance. I also really was impressed by your performance tying into our summer reading program theme; your research on the topic was impressive." "This was a very entertaining program. The children & their parents loved the performance. It was fun filled and the encouraged audience participation was great. Thanks for yet another exciting performance." "Mark Wurst stands out as one of the most entertaining magicians I have seen. 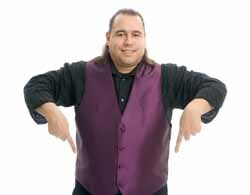 He is able to captivate and enthrall large audiences with his engaging magic tricks laced with lots of humor. I have also appreciated the fact that he is always punctual, professional, and organized not only in booking a show, but also in providing publicity materials and arriving for the actual performance." "Children and parents certainly enjoyed the magic show you presented at our library this summer. Your "Rainforests, Recycling and Magic" kept our audience of 100+ enthralled. I like the fact that you blend magic with storytelling and the way you promote using the library. I certainly will recommend your program for schools and public libraries looking for programs." "Magician Mark Wurst has performed at the Arcadia Public Library several times in the last year. Each time he performs here, the children and parents are delighted with his sleight of hand tricks, jokes and overall stage presence. His humor, showmanship, and professionalism are exemplary. He inspires awe in his audience and encourages the children to read. I know I can count on him to show up early and be ready to perform at show time. He makes my job as a librarian easier." "The 190 people that attended enjoyed the show. You handled the kids well and I was appreciative of that because sometimes audiences can get a bit unruly. Anyway, thanks again for your promptness, your communication and the delight that you brought to the Cerritos Library patrons." "Thank you for making our daughter Sarah's birthday a wonderful and memorable experience for her - and her family! You gave Sarah special attention on her "big day" and I could tell she really felt important. Her friends and family were very entertained and we liked the way you called each child up to be in the spotlight so that they all had their 'moment.' You are a great entertainer and magician!" "The children had a wonderful time and you kept the pace lively with jokes and fun. Your music and sound effects along with the new stage set-up are most effective. The kids loved you! You helped make our Summer Reading Program a success!" "Your program, "The Magic Of Books" was enjoyed by all - it was great to see so many people spellbound. As a result, our magic books have disappeared from the shelves! You always provide great entertainment, and you encourage reading too - thank you!" "Thank you for the outstanding performance on July 17th at the Big Bear Lake Library. Your Rainforests, Recycling and Magic program was both informative and entertaining. We all enjoyed your magic and comedy." If you're looking for a Magician in New Jersey, New York City or parts of Eastern Pennsylvania, call Mark H. Wurst TODAY!